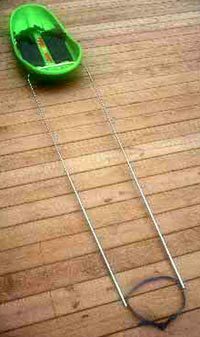 For the winter trekkers and cross country skiers, you might be interested in using a Rocket to pull gear. Its called a pulk when used with poles attached to your hips so it drags behind you on the snow. For instruction on how to make one yourself, see the diagram below and the list of parts you will need. 1 inch or 3/4 inch diameter, 5-6 feet long each (x2) Any color. Other types of poles are fine. Just be sure they do not become brittle in cold temperatures. Telescoping aluminum tubes can be used but they tend to dent and accumulate ice. 2 inches wide, 8-10 inches long (x2). The webbing must be wider than a 5/8” grommet. 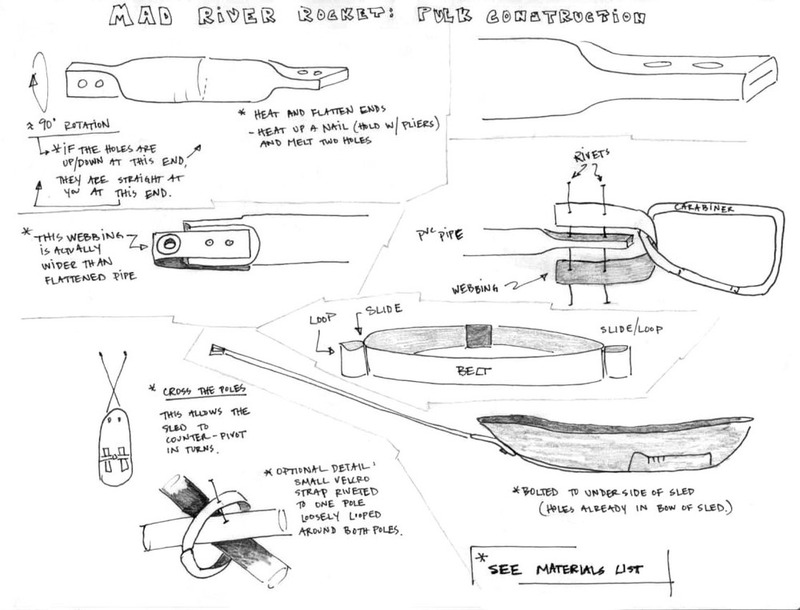 This webbing is just like the material used as the lap belt on your Mad River Rocket sled. 1 inch wide, 8-10 inches long (x2). This can be varied depending how you want to attach the rigging to yourself. Some people use Velcro straps instead of carabiners. 1/2 inch steel rivets (x8). The rivets must be long enough to hold the webbing and the flattened pvc pipe together. 5/8 inch diameter hole (x2). The bolts must be able to fit through the grommets. These are the same grommets as on the lap belt of your Mad River Rocket Sled. Grommets often come in a grommet kit with instructions. 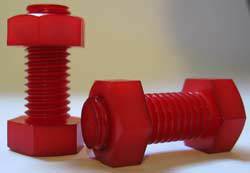 (6) RED NYLON NUTS & BOLTS (x2) that come with the sled or any similar nut/bolt fastener you can find that works. Wingnuts are quick and easy to put on and take off.